Are you trying to improve your game, but you are not sure where to start? We have the answer for you: The PDSA Individual Player Development Plan. The plan allows you to plan your improvement and allows you to achieve your full potential! The Individual player development guide is created with only one goal: to put you in charge of your development and to help you become a better soccer player. This guide will help you to take charge and be responsible for your own development. 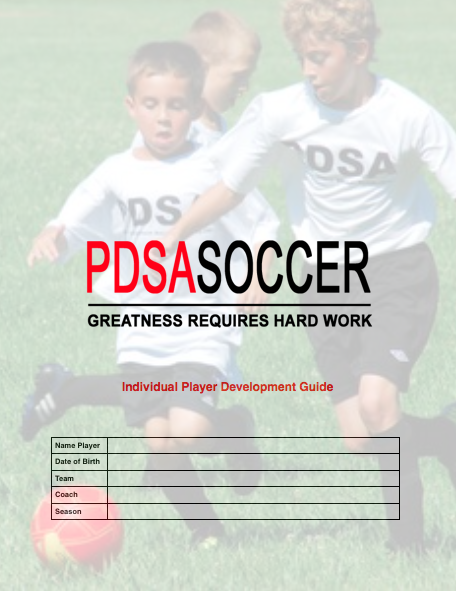 With the PDSA Individual Player Development Guide you are in the drivers seat when it comes to your development as a soccer player. YOU ARE IN CHARGE. There is no reason at all why you would not be able to reach your goals. In the first chapter we are teaching you about how to set goals. By making your goals SMART you will be able to really focus on improvement. In the next chapter we will help you actually to set your goals and we will focus on which technical, tactical, physical and mental development points for the upcoming 4 weeks. When we know what we want to develop in the next month, we will create a training planner, which will get us a day by day plan on how to achieve our development goals. You can use this method every 4 weeks, just reprint the page after 4 weeks and you are good to go again. In the chapters after your goals, development points and training planner we provide you with information about how to be successful in your training sessions. We have an extensive nutritional guide, a hydration tool and we teach you all about the PDSA keys for success in games and our training culture. All this information is key for you to get the most out of your training. Use these tools in your every day life, and every training session or game you play! The final chapter of this ebook contain information about PDSA and our programs. We offer a wide variety of training programs at our locations, but also online programs that allow who do not live close to one of our training locations to work on their development as a soccer player. If you have any questions about any of our programs I am always more than happy to answer them. As I said before, I truly believe with this PDSA Individual Player Development Guide you are in the drivers seat of your development as a soccer player. With the tools we provide in this guide, and our additional training programs there is no reason why you would not be able to achieve your goals. The only thing that can hold you back, will be you. Are you ready to put in the efforts required to get the results you want?